In England from quite early times leather vessels were used very generally. 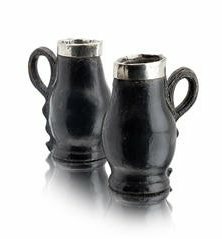 The black jack was a kind of leather pitcher or jug always lined with pitch on metal, of massive and sturdy build, corpulent and capacious. It quite dwarfed all rival pots, mugs, or pitchers of leather. Pictured right: A Charles II Silver-Mounted Leather Blackjack Jug Unmarked, Circa 1682. The silver rim with hatched lappets, the front with oval silver plaque pinned on below the spout which is inscribed The Gift of George Barteram to Abigail 1682 11 in. (28 cm.) high. Sold for £2,750 at Christies, London, March 2009. Image Copyright Christies. In the fifteenth century they were called ” jacks ” ; New College, Oxford, in 1414 pur-chased ” four leather jacks two holding a gallon each and two a pottle each, the four costing four shillings and eightpence.” The vessels were not known as black jacks till the sixteenth century, being occasionally described before then as ” Jacke of leather to drinke in.” The word jack was used for various articles—there were ” kitchen jacks” to turn the roasting spits, and leather coats were ” jacks of defence.” This defensive coat was known in England for several centuries as “the jack,” and when adopted by the French archers was called ” jaque d’Anglois ” ; the prefix ” black ” was no doubt added to the drinking jack to distinguish it from this leather jerkin, which would generally be made of buff leather and as a rule of lighter colour ; the vessels were not known as “black jacks” jacks till the sixteenth century, the full title was used in 1567 when Corpus Christi College, Cambridge, purchased a black jack for one shilling. Pictured left: A William And Mary Leather And Silver-Mounted Black Jack, Circa 1690 Of tapering form 7½ in. (18.5 cm.) high. Sold for £1,375 ($1,907) at Christies, London, January 2009. Image Copyright Christies. The black jack was a feature of the cellars, butteries, and dining halls of our ancient hospitals, colleges and grammar schools till modern times. The chief reason for its survival in such places is that the jack was essentially a vessel for the refec-tory or the baronial hail; it held a high place while the ancient mode of living prevailed, and every man of substance took his meals in his hall with his family and servants. When more luxurious fashions came in and the lord took his meals privately in parlour or dining room, the leathern pot re-mained in the servants’ hall with the excep-tion of those that were silver mounted. These latter were small as a rule and more richly treated; they were edged with silver and often lined with that metal or with pewter in the seventeenth and eighteenth centuries, and were highly prized. There exist to-day (mostly in private collections) quite a number of these silver mounted jacks; they were more numerous than the plain ones. They no doubt owe their preserva-tion to the fact of their greater value and the ornamental treat-ment and extra beauty of work-manship bestowed upon them. Jacks were not rimmed or lined with silver from a fastidious dislike to drinking from leather, for jugs and cups of various materials, earthenware, wood, coconut vessels and even china were habitually so mounted. 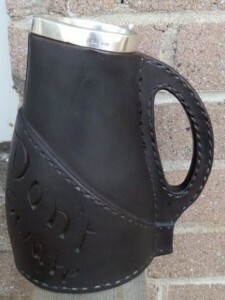 Pictured right: Doulton Lambeth Black Jack Leather Silver Rim Beer Pitcher Motto Jug 1880s. Sold For Us $425.00 Approximately £271.05 on ebay, April 2012. The black jack did not require a lid and was seldom made with one, but occasionally lidded ones are mentioned in old inventories. At the Guildhall Museum there is an interesting jack which has a curious lid of leather, but it is obviously an addition that was made at a remote period in the jack’s history. The lid not only covers the top but reaches nearly an inch down the sides ; it was a hinge of iron which has a long strap over the lid itself in which is a thumb-piece to enable the person holding the ack to raise the lid with the same hand. Sometimes a wooden lid was used attached to the handle by a leather strap by means of which it could be fastened down to a buckle on the spout. It is probable that ]acks with lids were used when it was necessary to fetch drink from a distance, not every village having an alehouse. Besides the wooden cups, which were so numerous in past times, cups of horn, pots of pewter and other metals, would all compete with leathern mugs, and help to render them unnecessary. By the middle of the seventeenth century many of these were in general use and the necessity for leather pots of small size would not be great ; records of them are scarce. Pictured left: Doulton Lambeth Blackjack jug “The Landlords Caution”. Made from stoneware that’s impressed with leather when still wet and then fired. It gives a very convincing leather effect that’s complete with stitching detail and grain. 7 1/2″ tall and 7″ spout to handle. 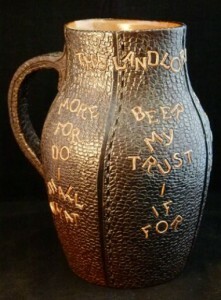 The jug has the words from the poem “The Landlords Caution” “THE MALTSTER HAS SENT HIS CLERK – AND YOU MUST PAY THE SCORE – FOR IF I TRUST MY BEER – WHAT SHALL I DO FOR MORE” written about it in an unordered way. I believe the idea is that as long as the landlord hasn’t drunk too much of his own product he should be able to work out the order (as a former Landlord I can relate!). This particular jug was stamped as made for Sidney W Allen of 39 White Rock, Hastings. It also has a Doulton Lambeth stamp as well as Doulton and Slaters patent stamp. Sold for £65 on ebay, April 2012. Pictured right: A magnificent 17th Century leather bombard or blackjack. 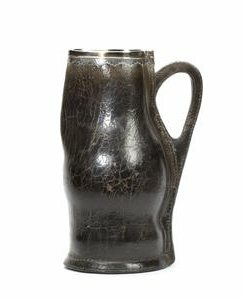 Of slightly waisted bottle form with projecting pinched lip, the unmarked silver-mounted rim with triangular hatch-engraved scalloped frill, over stitched handle and foot-rim, the whole of fine patination, 37cm, (14.5″) high Sold for £4,560 at Bonhams, Chester, January 2011. Image Copyright Bonhams. We know that black jacks were used in very early times from refer-ences to them in accounts of monasteries and col-leges that have come down the ages to the present day. They were certainly in use prior to 1350, for in the Ordinances of the Bottilars of London we find “botellis et aliis vasis de corro,” i.e. bottles and other vessels of leather and, as mentioned, long ago as 1414 New College, Oxford, purchased four leather jacks for four shillings and eightpence. In 1395 at the Priory of Yarrow three large jacks were enumerated, with two wooden cans, in the pantry, and at the Priory of Finchale in the same county on St. Dun-stan’s Day, 1397, there were four small ones in the buttery with eight large cans of wood, but wooden cans do not last, and when the next In-ventory was taken on Christmas Eve, 1411, the wooden cans had been replaced by six large drinking jacks. At Durham Abbey they were used in the hall of the Guest-house in 1427. They were also used in the time of Queen Elizabeth ; a work called ” Wits and Fancies,” printed in 1614, records ” when Henry III of France chmanded of Monsieur Daudelot what especial things he had noted in England during the time of his negotiations there, he answered that he had seen but three things remarkable ; which were that people did drinke in bootes, eat raw fish, and strewed all their best rooms with hay ; meaning black jacks, oysters, and rushes.” Huge pots of leather are still in existence in public and private collections which are judged by dates and initials incised upon them to have belonged to the household of King Charles, most of them are stated to have come from Kensington Palace early in the last century. Pictured left: A pair of mid 18th century silver mounted leather blackjacks, Unmarked. The rim mounts each engraved with two hounds, one named ‘Merryman’, the other ‘Conqueror’, height 17cm. Sold for £4,750 at Bonhams, Edinburgh, May 2012. Image Copyright Bonhams. 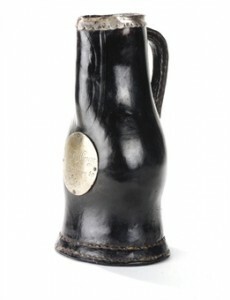 Though the black jack was often of considerable size, there were pots of leather still larger, called bombards, the lightness of the material in proportion to its strength was such that they could be made bigger than drinking vessels of any other kind, with-out becoming too unwieldy; the great weight of earthen or metal pitchers of large size made them inconvenient even when empty. Bombards were made in the sixteenth and seventeenth centuries holding six or eight gallons for households or communities that were rich enough and hospitable enough to use them. The name was given them on account of their having some resemblance to the larger and clumsier cannon of those days. 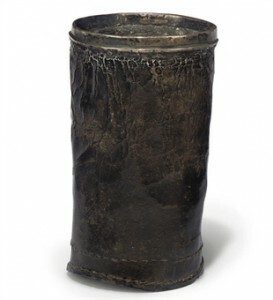 The term “black jack” was, after the sixteenth century, the generic name for all leather pots from mugs upward, and therefore for the very large sizes the names ” bombards ” and “black jacks” were interchangeable. Jacks and mugs are now so rarely to be found and when offered for sale realise such high prices that the temptation to manufacture shams is great, a mug with straight sides is easily made, but spurious specimens are easy to detect, in such false pots the bottom is often flush with the sides. The genuine jack had always a deeply-recessed bottom (the best way to make it water-tight), as the seams projected considerably and the bottom always being liable to swag with the weight of the contents might bulge and so wear through or prevent the pot standing. In a genuine black jack the handles are always a part of the same piece of leather as the body of the vessel, and continuous with it; all jacks with handles stitched on are shams. Of course, a fraudulent black jack could be made of old leather with the handles continuous, but the stitching would not be sunk in as it is in genuine ones and the newly cut edges of the leather would be sharp and raw, and the surface would not have the soft polish of a mature one that had been in use for many years. Very fine specimens of leather bottells, bombards and black jacks can be seen at the Victoria and Albert Museum, South Ken-sington; these are the splendid collection of the late Humber H. Edmondson, loaned to the Museum by his son.